The benefits to adding more protein in your diet are endless: larger muscle mass, fat loss, stronger bones, etc. As a new mom, I know that protein is an important part of my diet to give me the strength I need throughout my day. Not to mention, my husband is always looking for high protein snacks at the end of his daily work out. Want to know our favorite way of consuming protein? This smoothie is a perfect dairy-free option for those wanting to add a little protein in their diet; best of all, no protein powder required. Measuring in at a little over 14 g of protein, this delicious Chocolate Peanut Butter Protein Smoothie gives you about 1/3 of your daily protein intake. 1. Place ingredients in a blender starting with the heaviest ingredients (ice, sliced banana, peanut butter, cocoa powder). 2. Pour Silk on top of other ingredients. 3. Mix in the blender for 30 seconds on medium or until ingredients are well blended. 4. Sit back, relax, and enjoy this tasty smoothie! Being a mother to the pickiest eater in the world, protein smoothies are a huge life saver! Best of all, using Silk Soy Milk in our smoothies provide us with an excellent plant based source of protein. Naturally low in saturated fats and containing no cholesterol, the benefits to using Silk are endless. 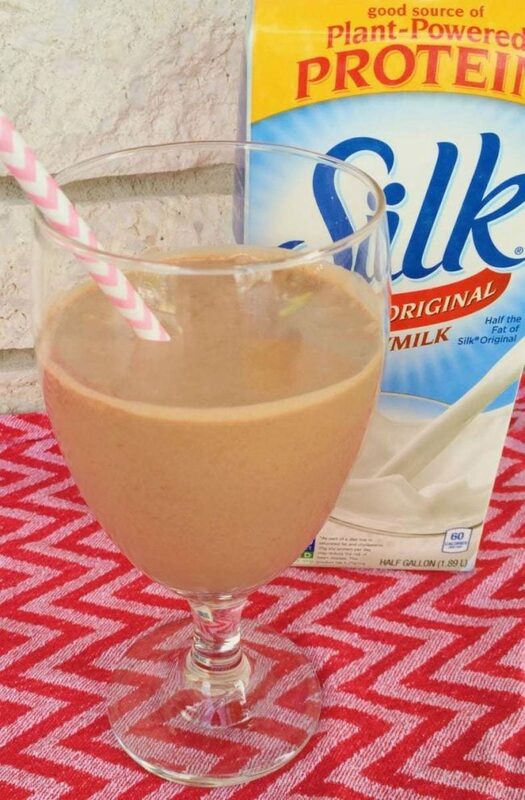 Not only do we love using Silk in our protein smoothies, but I have it every morning with my breakfast. Breastfeeding a baby with a dairy sensitivity, Silk is a delicious dairy-free option. Incorporate more protein in your diet with the help of Silk Soy Milk. Be sure to visit Silk for coupons and to find a retailer near you. What’s your favorite way to consume protein? Previous Post: « 5 Experience Gifts Moms Will Love! Mmmm, one of my fave ways to have a smoothie. Best ingredients! I love to make smoothies. I will have to try this delicious recipe on the weekend. Protein bars are a great way to get some protein into your diet. This looks like a fantastic smoothie. I love having them for breakfast. I love to snack on nuts for a protein boost. We make this smoothie all the tie at our house! My kids and I both LOVE it! Especially because it keeps us full on busy days! I love Silk milk! This sounds tasty! This looks so good. I can’t have soy milk, but I could totally substitute Silk Coconut milk and make this. What a sweet photo. I bet my kids would love this recipe! This sounds so good! I love that it is a healthy option for breakfast too! We are Silk Soy milk lovers. Delicious smoothie to enjoy with the family! I wouldn’t mind one of these each morning. I do usually have a carton of Silk in the fridge. You had me at chocolate peanut butter but the added protein is an awesome bonus. I will definitely be making this smoothie sometime very soon! My husband eats a lot of protein packed meals. I admit, I do not because I am not crazy for shakes and such! I love smoothies. This one sounds like it is full of protein. I love Silk, peanut butter, and chocolate, so why not, right? This sounds delicious. I could even see adding in a banana for some post-workout potassium. Thanks for sharing. This looks yummy! I could certainly benefit from some extra protein in my diet. I wish I could have Soy! This sounds SO good!!! In my family, peanut butter makes everything better. Smoothies are a huge hit around here so I’ll have to try this. It’s so important to get enough protein into your diet. Whenever I make a smoothie for myself or the kids, I always make sure it’s got plenty of protein. This smoothie fits that! We like to take our protein supplements with peanut butter bases. This recipe sounds great with banana and chips!